78830 Private Thomas Davis, 1/4th* battalion, the Northumberland Fusiliers was killed in action 4 November 1918 and is buried at Fontaine-au-Bois Communal Cemetery, France. He was 20 years old and is commemorated on the Evenwood War Memorial. Thomas and the younger children were all at school. Thomas’ older brother James served with the 2nd Reserve Cavalry Hussars, regimental number 82711. 4 November 1914: The Battle of the Sambre and the engagement leading to the capture of Le Quesnoy involved the XIII Corps and took place. The 50th Division together with 18th and 25th Divisions saw action. Perhaps Private T. Davis was among this number of men. Private T. Davis is recorded as serving with the 2/NF and it is reported that the battalion joined the 150th Brigade, 50th Division from 15 July 1918 to the end of the war. The Northumberland Fusiliers lost 30 men 4 November 1918, 24 of whom served in the 2/NF. It is assumed that remnants of the 1/4th NF joined the 50th Division and served alongside 2/NF. “On the 4th November, the last great battle opened (the Battle of the Sambre) on a front of 30 miles, stretching from the Sambre north of Oisy to Valenciennes. The 50th Division (having been in reserve for a few days) attacked and with the 25th and 18th Divisions of the XIII Corps overran the enemy positions. The 50th Division advanced through the southern portion of the Feret de Mormal. An advance to a depth of 5 miles was made on the 4th and on the 5th a still greater push brought the British Line well to the east of the Foret de Mormal. 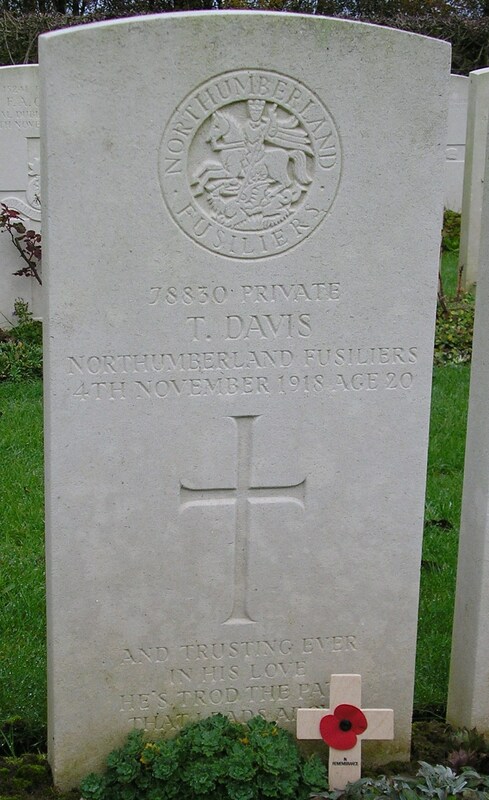 Private T. Davis was killed in action 4 November 1918. The circumstances of his death remain unknown. The Fontaine-au-Bois cemetery is located some 7 kilometres to the south of Le Quesnoy. In view of this and the relatively high number of other casualties buried on the same day in this cemetery, it is assumed that Private T. Davis was involved in offensive action in the area of Le Quesnoy. Private T. Davis was awarded the British War and Victory medals. Evenwood Church Magazine May 1918 reports a Thomas Davis as No. 15 in the draw at Randolph Colliery to supply 97 names of those aged 18 to 25 from whom 37 recruits would be selected. If this is “our” Thomas Davis who died in November 1918, this would have meant that he would have been on the front line within 6 months. At the beginning of the war, Kitchener’s New Army recruits needed about 9 months training before they went overseas, say they volunteered in August 1914 and at the front in May 1915. Is “our” Thomas Davis the same one mentioned in the Randolph Colliery ballot?